Zambon's Pharma Technology Department optimizes formulation and blending stage thanks to Cyclops, the IMA-designed tumble bin blender. Established in Vicenza in 1906, Zambon is now headquartered in Bresso and operates onthree continents – Europe, South America and Asia. With its 2,800 employees in 15 countries and a consolidated turnover of € 667 million, Zambon has managed to earn an excellent reputation for the quality of its products as well as flexibility and care towards customers. This strong identity is based on an integrated organizational structure: Zambon Company S.p.A. is the industrial holding of the Zambon Group, made up of Zach System, the fine chemicals division, Zambon S.p.A., a pharmaceutical multinational company, and Z-Cube, the Corporate Venture of the Zambon Group that achieved to launch three start-up companies thanks to highly innovative projects. The Innovation area includes R&D and activities dealing with process and product innovation. In addition to in-house research, an Open Innovation perspective, Zambon collaborates with external partners, Research Institutes, Startup Companies, Technology Transfer and Biotec Companies. The Pharma Technology Department handles in-house pharmaceutical development, which includes Pharmaceutical Research devoted to formulation and process development in laboratory scale as well as analytical development, and Pharmaceutical Development & Industrialization for pilot scale and industrial transfer. Organization is decisive in the desire to develop the formulation and the process together, in synergy with analytical development, and in close contact with industrial perspective. This allows for targeting a systematic and coherent study aimed to innovation in the formulation approach and in production and analytical technologies, with the establishment of comprehensive and shared technical know how. This is especially significant when setting the pharmaceutical development recommended by the ICH Q8 guidelines and, in particular, Quality by Design. It is in this context that the project was set, which led the Pharmaceutical Research facility of Zambon’s Pharma Technology Department to purchase an IMA blender with which to tackle the formulation and process study starting from the laboratory scale. IMA Active’s experience and the proven applicability of its equipment for R&D have been decisive in the choice. «IMA was identified as a supplier thanks to its excellent references as regards laboratory-scale and research equipment, GMP aspects, process knowledge and its vast experience with process analytical technologies (PAT) in the blending field». «The IMA blender is compact and mounted on wheels for laboratory scale, has been designed in accordance with GMP, is consistent with larger scale systems, and features a highly innovative bin-coupling system». Equipping Zambon’s Oral Solid development laboratory with a rotary powder blender to study and optimize the blending process. Zambon’s Pharmaceutical Research was pursuing this goal when it chose Cyclops, the tumble bin blender designed by IMA. Due to its features, similar both in laboratory scale and in pilot and industrial scale, Cyclops optimizes the scale-up steps. In general, laboratory scale blending is carried out in bags or, alternatively, by means of small blenders that, due to their structural characteristics, facilitate the formation of segregation areas which are harmful to the process. Moreover, since the shape and movement of traditional equipment differs from that adopted in pilot and industrial scale, it does not allow the studying of directly scalable processes. 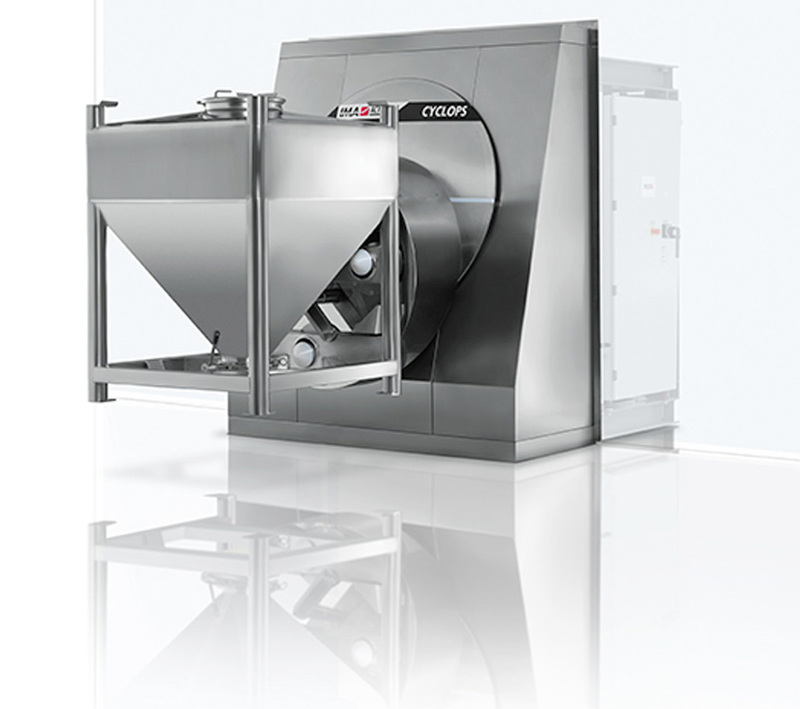 Cyclops ensures blending uniformity and scale transfer at the same time. Cyclops meets the pre-defined double and single tilting working requirements, modulating the rotating speed and stop time, selecting the rotating direction and changing it even during the rotation cycle, and has been equipped with bins of increasing capacities (5, 10, 20 liters) suitable both for the production of small trial batches and the systematic study of the blending process. The Zambon project is part of the process analytical technologies (PAT) implementation: the powder container was coupled to a NIR spectrometer for the in-line monitoring of the blending process. IMA verified Cyclops suitability to support the weight and bulk of a rotating spectrometer in collaboration with Zambon Pharmaceutical Research through computer simulations. All bins have the same neck in order to use a modified cover, with the addition of a sapphire window to house the NIR spectrometer. Moreover, the cover has been fitted with inlets for the powder sampling probes. IMA and Zambon ran the FAT and SAT tests together on the blender coupled to the spectrometer. The NIR spectrometer can perform a chemometric analysis through the continuous acquisition of spectra, evaluating their change according to blending uniformity. This is exactly where the real innovation of the Zambon project comes into play: setting up a PAT system that, being applicable both to laboratory scale and industrial scale, allows the achieving of a rational and correlated blending profile. Reformulating a product in sachets with the aim of improving patient compliance (palatability), by applying a novel, patented taste masking approach, led Zambon Pharmaceutical Research to change the composition of a blend in which flow optimization was critical, not only to ensure the uniformity of the content of the active substance and the ingredients responsible for the taste masking, but also to improve efficiency during the packaging of the preexisting product. A study was conducted both on the formulation (optimization of excipients, evaluation of active substances from different suppliers) and on the process parameters (blending speed and time). In the first part of the study, preliminary scale-down of the reference product was performed in order to correlate the industrial scale blending process with laboratory bins. Using a mathematical approach (based on Froude Number) and the in-line control with the NIR spectrometer, it was possible to obtain the starting parameters scaled by the industrial reference process, confirmed by the off-line analysis with UPLC on samples taken from the bin in different points to determine blending uniformity. These parameters, preliminarily tested with the new formula, provided the expected NIR profile and the appropriate physical characteristics of the blend. In the second part of the study, the effect of the critical variables (active substances from different suppliers and addition of an excipient having a different composition) was examined, through Design of Experiment, on the chemical-physical characteristics of the new blend, keeping constant the operating conditions specified by the NIR in the previous study. The interpretation of data obtained through the qualitative/quantitative analysis (NIR profile/UPLC analysis) and the statistical evaluation of the various responses such as blending uniformity, flowability (Carr Index, %), repose angle and density have shown that the blend’s flowability depended on the particle size of the active substance used. As expected, active substances from different suppliers have different physical properties that lead to different behaviors of the final blend. Moreover, the variability of the physical properties has no impact on attaining blending uniformity, which is ensured even while significantly prolonging blending time, thus confirming the reliability of the screening study. As such, it was possible to correlate the NIR profile with powder flowability and type of active substances used, and this information was used in the next industrial scale up stage. The high degree of innovation with which this study was conducted allowed Zambon to register its product without any observations on behalf of the examiners.